Due to a perfect storm of circumstances, our family has been living very, very simply over the last several months, especially this summer. It's a move of solidarity for Jim and me, and our kids never notice the difference either way. Since last winter we've been learning (again) to rest in what we have for today, to be thankful for daily bread; practicing the art of not worrying about tomorrow. Not long after this season began, our church even had a series on the Lord's Prayer (in case we needed more reminders), and now months later, we're still more than fine. I love having so many things to look forward to from our garden; there is an ancient rhythm to it. We waited and waited for things to grow and now every day there is something new. We take what we need, what's ready, and the next day more is waiting for us. We will get creative and a bit impulsive, combining what we have into endless meals, possibilities. We pick and eat, and the plants replenish, keep giving. One thing slowly phases out just in time for something new to make its appearance. It goes like this until Autumn, when we'll pick the Great Pumpkins and the last of the carrots, then the big sunflowers, and then our garden will rest. Everything relaxes in summer, including planning a menu. Now it's more like suggestions, ingredients to have on-hand, as we wait and see what we'll bring in today. It's keeping a list by the sink, "Use the chard!" or, "Keep checking the cilantro!" Last night it was a huge bunch of beets the size of baseballs, made sweet and laid out gorgeous and ruby red on a platter. 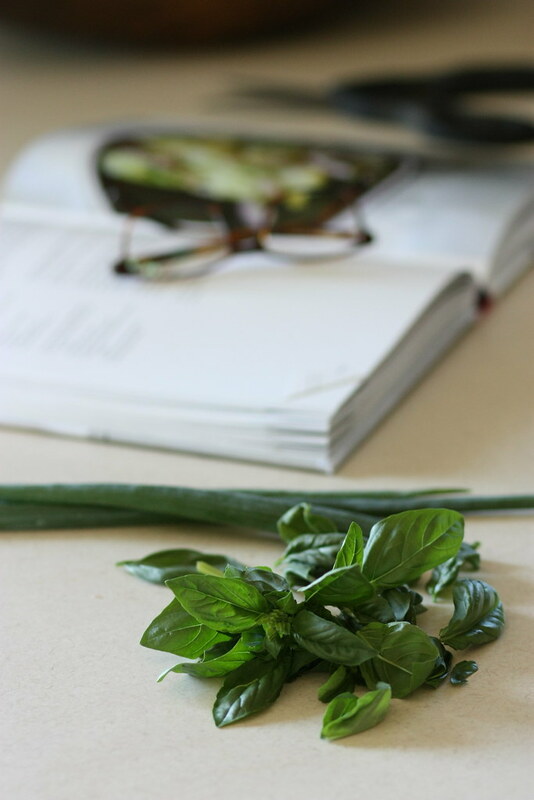 Today it's handfuls of basil and I'll make a simple pesto. And, of course, the cucumbers are here. And so we eat, and we're very grateful.